No, this isn’t a metaphor for the state of society, or even our political standing. The infrastructure built to keep the U.S. functioning efficiently and safely is literally falling apart. You might see it on your way into work: potholes, cracked streets, leaning buildings, and water main breaks that flood roads on the regular. No, it’s not just your town that needs repairs. And investors in the space today could be looking at equally high-flying profits as the crisis comes to a head. Did you know that we drive 1.1 billion miles every single day? And the roads we drive on? They’re falling apart. The American Society of Civil Engineers gives the country a report card every year grading individual aspects of U.S. infrastructure. Our most recent overarching grade? D+. We’re just short of a national disaster at this point, and it’s only getting worse. Of all the things the report takes into account — aviation, bridges, dams, drinking water, energy, hazardous waste, inland waterways, levees, ports, public parks, rail, roads, schools, solid waste, transit, and wastewater — only four of them were graded a C or above. The best was railways, with a B. The worst, surprising no one who’s ever ridden a bus or train through a city, was transit with a D-. I don’t know about you, but for me, anything lower than a C is straight up failing. The one thing I really don’t want to fail on me? The roads and interstates I drive on every day. Unfortunately, that’s exactly what’s happening all across the U.S. right this minute. 250 of the most heavily used bridges in the country that are considered structurally deficient can be found on interstate highways. Nearly 90% of these were constructed almost half a century ago! It’s long past time we got some upgrades. What Will This Cost You? Americans squander more than 4 billion hours sitting in traffic jams due to lack of new roads. All that wasted time costs nearly 3 billion gallons of fuel. That’s a huge amount of wasted time and money. Fortunately, the reality of our infrastructure problem is about to take a prominent position in the public eye. Right now, our president is working to divvy up a $1 trillion investment for replacing and upgrading aging U.S. infrastructure. $1 trillion seems like an obscene amount of money, but the American Society of Civil Engineers estimates we’ll need more than double that to fix the problem. That includes things like roads and bridges, but also oil and gas pipelines, hydropower dams, and the energy grid itself. But that’s not even the half of it. We have evidence of the crumbling system every day. I’m talking about disasters that could kill many, many people. Just one example you may have heard of is the crisis that took place at the Oroville Dam in California in February 2017. The dam suffered deep erosion and, with a sudden influx of rain, was threatening to burst. 188,000 residents were evacuated from the area, with levees in the same area growing dangerously full. This is what happened when part of the spillway eroded. Engineers are still desperately trying to repair the damage, but they will have to delicately balance the need for the spillway with the fact that using it (which they have to) will further weaken it and possibly cause the dam itself to break open. But guess what? 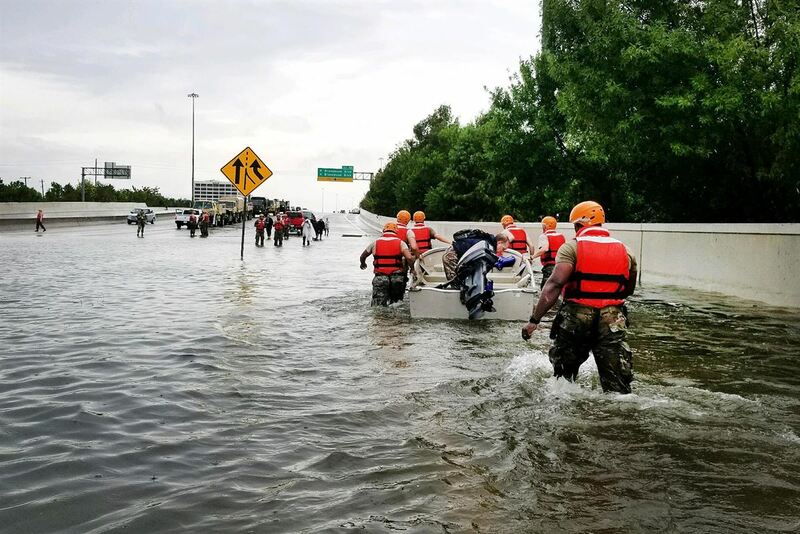 California’s infrastructure rating is a C.
More recently, Hurricane Harvey hit southern Texas harder than anyone imagined, flooding roadways and causing even sturdy dams to overflow! The massive storm has been likened to Hurricane Katrina, which hit landfall almost exactly 12 years earlier. Katrina cost Louisiana $108 billion, not including the long-term relief aid that was sent to the state for years afterwards. Harvey is expected to be even costlier. And this is just damage from freak weather. In 2007, a bridge collapsed in Minneapolis, killing 13 and injuring 145. Four bridges collapsed in the Unites States in 2015 alone. 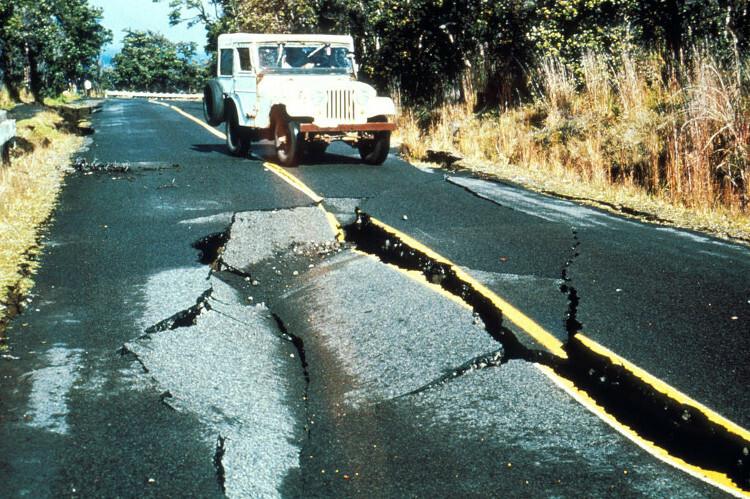 Even today, thousands more are at risk of collapsing at any moment, causing a deadly issue. Since 1989, we’ve had nearly 600 bridge failures in this country and, while they’re not widely publicized… a large number of bridges in every state are really a danger to the traveling public. What’s one thing we need to fix almost all structures? And it’s about to boom. You see, President Trump is going to need a whole lot of it to fix our infrastructure. Do you remember all the promises Trump made while on the campaign trail in 2016? Quite a few of them had to do with energy. The one promise that’s seen the most success in being fulfilled was President Trump’s outright support of the oil and gas industry. Specifically, he wanted to open more land to production of these fuels and support the development of a larger, stronger fuel transportation network. No doubt you’ve heard of the drama that surrounded the Keystone XL and Dakota Access pipelines, both of which connected the U.S. to oil and gas supplies in North Dakota and Canada. Early on in his presidency, Trump approved both massive pipelines. And while they’re both still steeped in controversy, there’s a good chance they and other pipelines like them will continue to appear across America. American steel, specifically. This is because Trump ordered that the pipelines and others like them be made with U.S.-made steel over foreign steel whenever possible. Steel production is up 7% worldwide, according to the World Steel Association. But it’s U.S. steel that’s important to us. You see, Trump wants to get steel jobs back to the U.S., and to that end, he now has plans to impose a 45% tariff on Chinese imports. 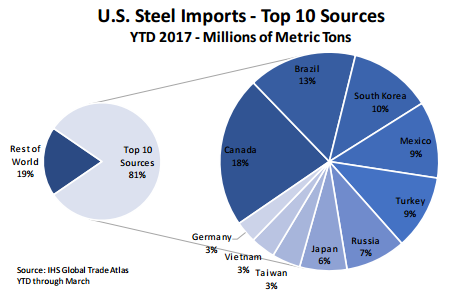 The U.S. is the largest importer of steel in the world. In 2016, we imported more than 30 million metric tons of steel from 110 countries around the world. Just 10 of those countries accounted for more than 81% of that steel. China, on the other hand, is the largest exporter of steel in the world. In 2016, it exported 106.6 million metric tons of steel, nearly a quarter of the world’s total steel exports. But you can bet that a 45% tariff on Chinese steel is still going to push buyers to turn to domestic steel. And that was without any policies in place yet. Now that his presidency is taking full effect, this industry is poised to jump even higher in the next few years. The American Society of Civil Engineers estimates that the U.S. will need about $4.6 trillion total from 2016 to 2025 to fix and maintain the country’s infrastructure. About $2.5 trillion of that is already funded in some way, shape, or form. The rest, nearly $2.1 trillion, will require additional investment from other sources. That’s about $206 billion every year for the next decade just to keep our bridges, waterways, and roads from simply falling to pieces. Without a doubt, a large portion of that investment will have to be into steel. Steel is about to experience a rebirth. And you need to be there at the start. Another major infrastructure investment is perhaps one of the most important commodities on Earth: water. While it seems like we have quite a lot, today’s infrastructure issues are making the lack of clean, drinkable water a bigger issue than ever before. You’ll note that the ASCE grading report includes dams, drinking water, waterways, and wastewater treatment on its list, and that not one of them is graded above a C.
If you’re not scared of a bridge falling out from under you, you should be scared of your water supply running out when you need it most. Not only are U.S. wastewater treatment plants on the list of things that are in immediate need of repairs and upgrades, but the pipes that run that clean, treated water from the plant to your home also require some serious attention. The most notable example of this in recent years has been the crisis in Flint, Michigan. It was found that old pipes in the city, and, in fact, all across the state, were deteriorating and leeching lead into the water being sent to homes, businesses, and schools. Flint is far from the only U.S. city to face this issue. 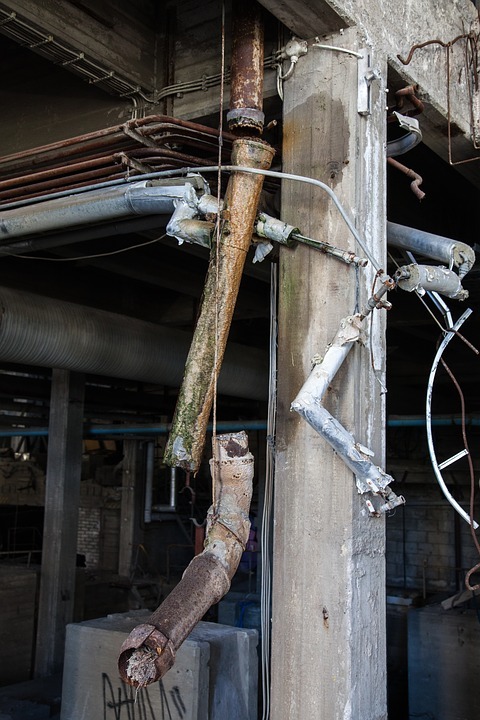 Schools across Baltimore, Maryland, have been struggling to get clean water supplies since the 1990s, and the longer we wait, the older and more dangerous these pipes become. This, of course, will lead to more investment in steel infrastructure, as the pipes and everything that supports them will have to be re-evaluated. If you’d like to learn more about investing in water — a commodity we literally cannot live without — you can read our report on the best water stocks now. I know you’ve come across a lot of decisions in your life that can be considered "no-brainers." Let me be absolutely clear here: improving America’s infrastructure is the most glaring no-brainer I’ve ever come across. Even if we ignore the fact that improving our roadways, dams, and bridges will have an incredibly positive effect on our economy, it all comes down to two things we simply can’t ignore: our safety and our time. We’re putting both at risk if these problems go unchecked. And not only will improvements to the national infrastructure boost GDP in the long term, but think of the massive headaches you’ll avoid. I’d also pay a lot to make sure that valuable property and the most valuable thing of all — human lives — aren’t destroyed because our roads need to be fixed. That dream can be a life-saving reality if we fix our crumbling interstates and bridges. Any improvements Trump makes on the country's energy grid will support more growth in solar and wind too. Is LNG Finally Pushing Infrastructure Stocks? Energy and Capital editor Keith Kohl takes a look at the pressure that U.S. LNG exporters are exerting on America's pipelines. Energy and Capital editor Keith Kohl explains why Trump is about to enact his ultimate revenge on the Standing Rock protesters.